The North Face Size Chart The ideal jacket for you're curious one during the transitioning seasons. 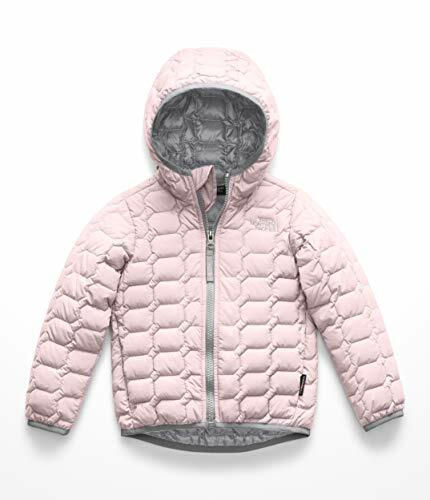 The lightweight ThermoBall™ Hoodie from The North Face Kids is the perfect go-to! Regular fit jacket leaves plenty of room for layering or worn as a stand alone. Synthetic Primaloft® insulation traps in heat without the bulk. Fixed hood with binding. Full-length zip with chin guard. Long sleeves with stretch cuffs. Embroidered brand marking hits upper left and back. Slip hand pockets. Straight hem with binding. 100% nylon;Insulation: 100% nylon. Machine wash, tumble dry. Imported. Measurements: Length: 15 in Product measurements were taken using size 2T Toddler. Please note that measurements may vary by size. Fixed hood with binding. Full-length zip with chin guard. Long sleeves with stretch cuffs. Embroidered brand marking hits upper left and back. Slip hand pockets. Straight hem with binding. 100% nylon;Insulation: 100% nylon. Machine wash, tumble dry. Imported. Measurements: Length: 15 in Product measurements were taken using size 2T Toddler. Please note that measurements may vary by size.